I would like to analyze the relation between asteroid spectral types and photometric data. MPC has made available an interesting web service to download data from their databases. The web service can be accessed running a powerful Python script that return a lot of asteroids' physical and orbital parameters (more than 100 columns!). This syntax allows you to get all asteroids belonging to taxonomy class A, B, C etc. without having to bother for those that are not yet classified. 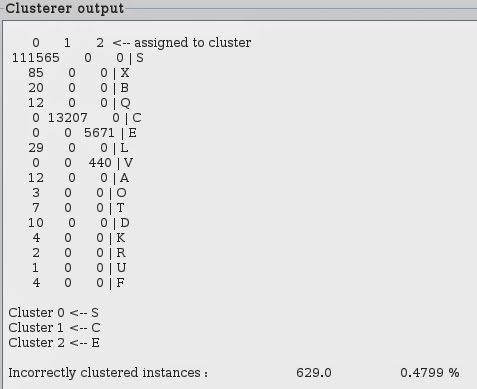 ... and so on, till I reached semimajor_axis about 2.5 au where I stopped: no reason to choose this value, I chose it just to limit the number of queries (although, the threshold of 2.5 au is also nice because this is the first big Kirkwood gap). After that, I had to convert the XML file (quite big: about 131000 ateroids) in a CSV file. Finally, I concatenated all CSV files together. I used a data mining package called Weka developed by the University of Waikato in New Zealand. Let's see how we can recognize these three groups based on some physical parameters chosen among color indexes. 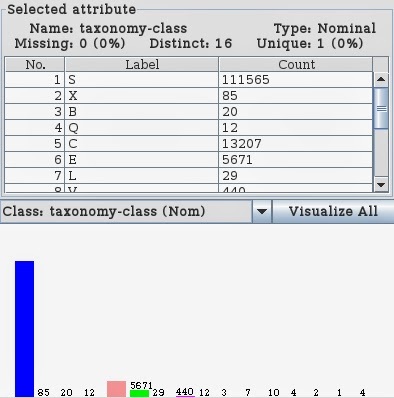 First of all I used the "Select Attribute" tool to rank the list of the most important parameters (among color indexes) that can be used to predict the taxonomy class. 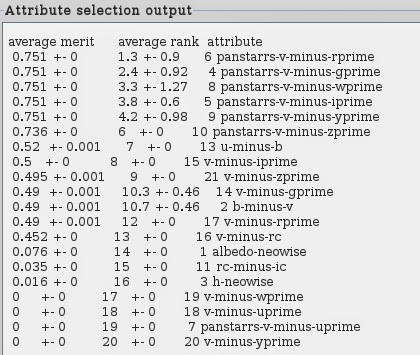 Panstarrs parameters are on top of the list, almost all with the same average merit. It is nice to visually show why. 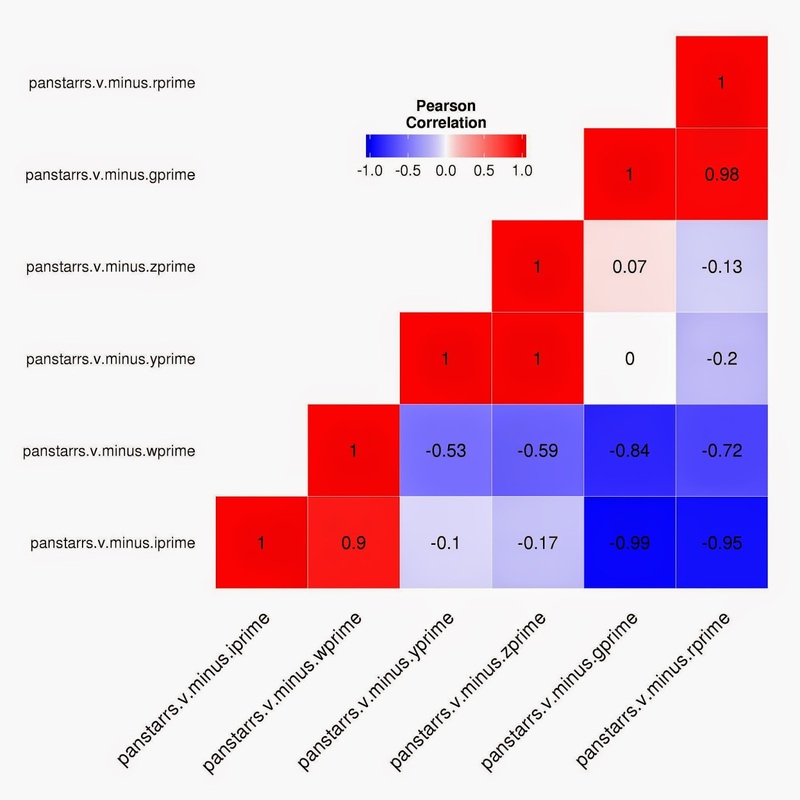 These graphs, made with the ggplot2 tool of the R package, confirm that the panstarrs parameters allow to discriminate between S-type, C-type and E-type asteroids. In fact, every single distribution is constituted mostly of asteroids belonging to the same taxonomy class. 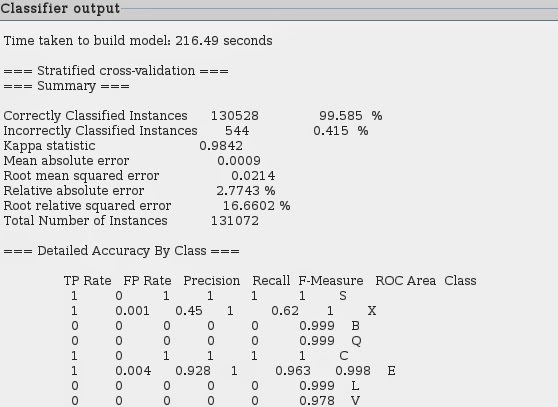 We can also visually display the covariance matrix as a "heatmap". All different types were mainly attributed to cluster 0 with the exception of V-type that were grouped in the same clusters of E-type asteroids. Cluster 1 is entirely constituted of C-Type asteroids. First of all, we must establish a performance boundary about what we expect to get (ZeroR model). There are 111565 S-type asteroid in a set of 131072 asteroids: the accuracy of any "true" model must be much better that 85%. As expected, very good performance not only for S-type asteroids but also C-type asteroids (precision and recall = 1) and E-type asteroids (precision=0.928, recall=1) - but failure to predict the other less numerous types.